Problem getting task info from Salesforce. We're having trouble getting task type data from Salesforce. This could be because the Salesforce user doesn't have permission to read the Type field. In the upper right, click Setup (or [Your Name] > Setup). In the left sidebar menu, navigate to Build > Customize > Activities > Task Fields. In the list of fields, click Type. In the upper right, click the gear icon settings and select settings Setup. In the left sidebar menu, navigate to Platform Tools > Objects and Fields > Object Manager. In the list of objects, click Task. In the left sidebar menu, navigate to Fields & Relationships. 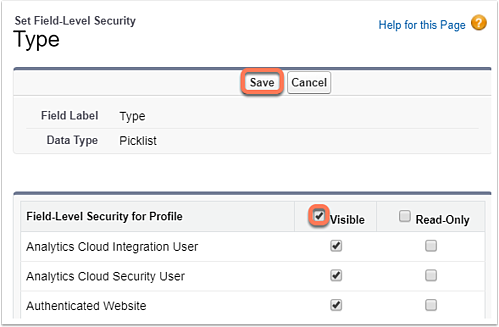 In the header row of the Field-Level Security for Profile table, select the Visible checkbox. At the top, click Save. This will make the task type field visible to all profiles. In the left sidebar menu, navigate to Build > Customize > Activities > Task Page Layouts. On the left of Task Layout, click Edit. In the left sidebar menu, navigate to Page Layouts. Click the Type item in the toolbar and drag and drop it into the desired location on the page layout. In the top left of the toolbar, click Save to apply your layout changes. In the Salesforce integration section, click the More dropdown menu and select View details. Click the Timeline sync tab. If the error has been resolved, the error message will no longer appear in the Timeline sync section.